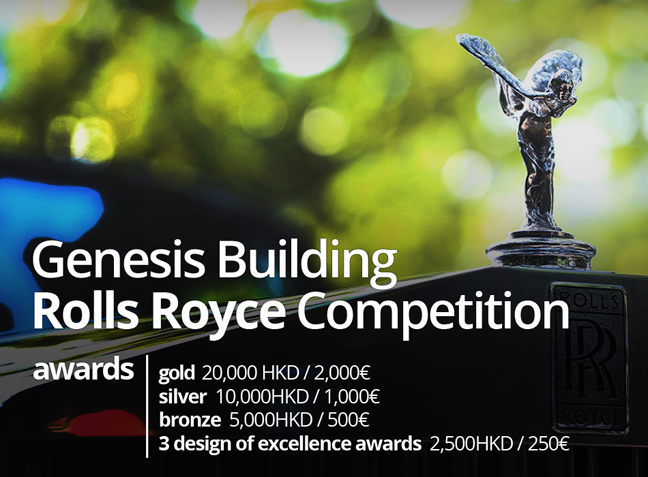 Hip Shing Hong (Holdings) Company Limited, in collaboration with Stefano Tordiglione Design Ltd and It’s LIQUID Group, is proud to announce the WINNERS of “Genesis Building Rolls Royce Car Competition”. Under the initiatives of Hong Kong Development Bureau to facilitate the conversion of industrial buildings, the project “Genesis” aims to revitalize abandoned industrial building into a contemporary vertical artist village at Hong Kong Island South. Genesis is now undergoing extensive design and renovation to revitalize the site into offices. With the purpose of rejuvenating the premises with modern energy and fitting it with a contemporary design, this old building is once again fulfilling the needs of modern life. Consisting of 22 floors, Genesis is anticipated to be completed in 2014, making a new chapter of adaptive re-use in architecture in Hong Kong. Elements of “Italian style” and “Ferrari” have been blended into the building. The unique Ferrari yellow of the skin architecture and the twists on the elevation are reminiscent of the outstanding speed of the Italian sports car Ferrari. The identical Ferrari yellow also makes the newly furnished architecture prominent and which adds vitality to the surrounding area. The introduction of the Vertical Twisted Architectural Fins is an attempt to “Dismantle” and to “Disorder” the monotonous elevation treatment of the original skin, whilst the Twists are the orthodox response to the Ascending Flyover right in the front of the site. The Vertical Twisted Architectural Fins also perform as the Vertical Lighting Devices for the architecture. Such “Verticality” reveals the Vertical Forces of the Ancient Gothic Church, but in a much more Contemporary Manipulations. The concept of the current lobby and 4th floor club house-recreation area of the building includes the elements of the 70’s design, the era when the building was initially built. Joining hands with Italian interior designer Stefano Tordiglione, the building incorporates Italian and Hong Kong 70’s design elements, transforming the old into new, blending the East with West. It will be the new cultural identity of Island South of Hong Kong, a landmark of its own personality. Design Architect: BARRIE HO Architecture Interiors Ltd. Authorized Person: BARRIE HO Architecture Interiors Ltd. The Rolls Royce car is a part of the design to be displayed in the lobby of the building Genesis. Artists were invited to re-style and reinterpret the design of the body of the car. With the car aesthetically revisualized, the purpose is to encompass the theme of ‘Innovation’, ‘Energy’ and ‘Creativity’, and at the same time, retain the elegance and luxurious identity of the premises.